When it comes to 3D printing, bigger doesn’t necessarily mean better. That said, large-scale 3D printing systems do offer unique manufacturing solutions that smaller systems cannot achieve. They can, for example, produce large prototypes and parts and even multiple series of smaller parts simultaneously. The advantages of large-scale 3D printing being clear, this one area that has seen a lot of activity in recent years. In light of this, we’ve put together a list of some of the top large-scale 3D printers on the market for industrial applications. We’ve generally tried to include AM systems with build volumes over 500x 500 mm. With a build volume of 4,000 x 2,000 x 1,000 mm, voxeljet describes its VX4000 as ‘the world’s biggest industrial 3D printing system for individual sand moulds and cores’. Additionally, the system can also produce small-series components and has a resolution of up to 300 dpi. The VX4000 uses Binder Jetting technology, which works by depositing droplets of a binder agent to fuse the powder material together. In contrast to many other systems, the build platform of the VX4000 is not lowered following each completed layer; instead, the print head and coater are raised. This allows the machine to bear the substantial weight of its build platform. The system also promises virtually continuous production thanks to its interchangeable build. Suitable for metal casting, the technology is a boon for industries like foundry or companies using casting and moulds in any way. One thing to keep in mind, however, is that the VX4000 comes with a hefty price tag: just over $1.5 million. But if such an investment proves too steep, voxeljet’s 3D printing services give you the chance to take advantage of its technology. 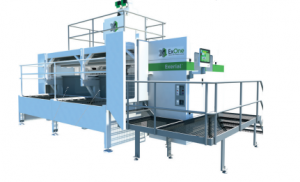 US-based ExOne is well-known for its Binder Jetting technology, used with a range of materials including metals, ceramics and sand. The Exerial 3D printing system is the company’s largest, aimed at industrial series production. The Exerial 3D printer is particularly suited to the production of sand cores and moulds within the aerospace, automotive, heavy equipment and energy industries. The machine also possesses a high level of accuracy and simultaneous post-processing needed. However, perhaps the most distinctive attribute of the Exerial is the ability to link multiple machines to create an automated production system. 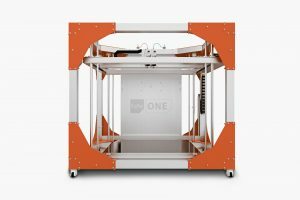 With a build capacity of over one cubic metre, the third version of the BigRep One is one of the largest FDM/FFF 3D printers available on the market. The system includes modular print heads and dual extruder, offering the flexibility of printing in two colours or materials, as well as semi-automatic print bed levelling. Its open build design offers a clear and unadulterated view of the printing process from all angles, while moving parts are well enclosed for safety. The system is compatible with BigRep’s proprietary filaments (PLA, PETG, PRO HT, PRO HS) and costs around $60,000 – making it a good option for large-scale applications in design and architectural modelling. The ProX 950 ranks as one of the largest industrial-grade SLA systems on the market. SLA typically works by using a laser to cure and solidify a vat of photopolymer resin, allowing parts to be built one layer at a time. With the ProX 950, two lasers are used. The ProX 950 can produce high-quality parts up to 1.5 m in one go — removing the need for assembly. It produces parts with a high level of surface quality and accuracy, with its accuracy said to rival that of CNC machining. In addition to its large printing capacity, the ProX 950 can also be used for low-volume series of smaller parts. It suitable for use with a wide range of photocurable plastics and composites and features a material delivery module for fast material changes. Applications of the technology include casting patterns, jigs and fixtures, medical models and functional prototypes. This year’s Rapid + TCT trade show saw EOS launch its P 810 for the first time. The launch expands the company’s already extensive portfolio of SLS 3D printing systems. Developed in cooperation with Boeing, the P 810 system is designed for use with HT-23 – a high-performance, high-temperature plastic. It is the first carbon fibre-reinforced PEKK material to be used with EOS’s systems, and produces high-strength, lightweight parts. That the P 810 is designed to be used specifically for the high-performance material makes it particularly suited to the aerospace industry, where strict requirements like UV resistance and flame retardancy must be adhered to. However, the system is also suitable for highly demanding applications in other industries, like automotive, or for producing large and highly accurate structural components like spare parts for the interior and exterior of buses and trains. 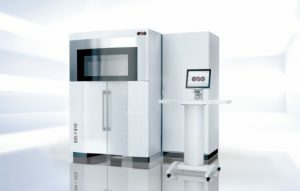 One of BeAM’s flagship AM systems, the Magic 800 uses DED technology to produce metal parts. The system works by using a powerful laser to fuse powdered metal material by melting it as it is deposited. 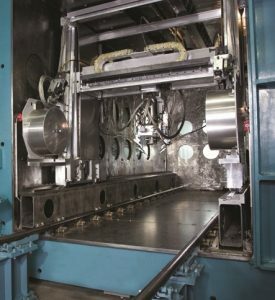 According to the company, its industrial AM systems typically use a deposition nozzle mounted on the Z-axis of a CNC machine, giving them a 5-axis motion. The Magic 800 is particularly well-suited for repairing various parts and components like aircraft turbine blades. In addition to repairing or adding features to existing parts, the Magic 800 can be used to produce small metal parts, and complex parts can be manufactured in a range of metal alloys. Its 5-axis movement is said to remove the need for support structures, reducing post-processing requirements. While US-based Optomec is known for its Aerosol Jet Systems – used for 3D printed electronics – the company has also developed a line of metal 3D printers. Optomec’s metal AM systems are based on its proprietary Laser Engineered Net Shaping (LENS) technology which works in a similar way to DED. LENS technology involves the use of a powerful laser to fuse metal powder together, producing fully dense parts layer by layer. The latest in Optomex’s AM systems, the LENS 850-R is targeted towards repairing, reworking or otherwise modifying large industrial parts for the aerospace and defence industries. It can also be used within hybrid manufacturing applications. The building process takes place in a hermetically-sealed chamber with full atmosphere control. Thanks to the technology, the machine can produce fully dense parts using various metals and alloys, including titanium, tool steel, aluminium, nickel, cobalt and stainless steel. Since launching its first Electron Beam Additive Manufacturing (EBAM®) system in 2009, US company Sciaky has built a solid reputation within metal additive manufacturing. Upon the release of its EBAM® 300 Series in 2016, the company claimed to have developed the world’s largest metal AM system ‘fit for the industrial/commercial production of functional metal parts’. With an impressive build volume of 5791 × 1219 × 1219 mm, this may not be so far from the truth. With Sciaky’s EBAM® technology, an electron beam gun is used to deposit metal wire feedstock layer by layer, producing metal parts with a fine surface finish. The system is designed to produce large-scale parts and prototypes using a range of metals and alloys, from steel to titanium and tantalum. Additionally, it can be used for parts production as well as for customised repairs. 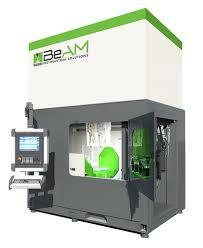 In addition to large build volume, the EBAM 300 Series offers fast deposition speed, ranging from 3 to 9 kg per hour. 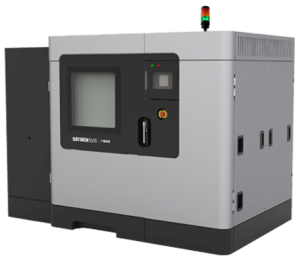 The Stratasys F900 is an industrial-grade FDM 3D printer designed for the repeatable production of thermoplastic parts (including nylon, ULTEM, PC-ABS and more). It builds on the company’s Fortus 900mc platform and is suitable for producing large end-use parts, jigs and fixtures, tooling and functional prototypes. 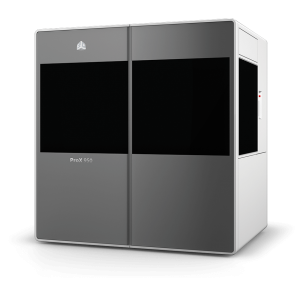 The F900 is only one of several large 3D printers offered by Stratasys, with the Objet1000 PLUS being the second largest system with build capacity of 1000 x 800 x 500 mm. High-performance ULTEM 9085 resin can also be used with the system. Closing our list is the MERKE IV™ AM system from Norwegian manufacturer Norsk Titanium. As its company name suggests, Norsk Titanium has developed its MERKE IV™ system to produce structural titanium components – components that are said to rival forged parts. Heavily geared towards the aerospace industry, the MERKE IV™ uses the company’s patented Rapid Plasma Deposition™ (RPD™) technology. RPD™ works by melting titanium wire within an inert atmosphere of argon gas to build up a titanium part layer by layer. According to the company, this process results in a reduced need for machining and a significant improvement in buy-to-fly ratio (up to 75%) when compared with conventional manufacturing. The MERKE IV™ is also said to have a deposition speed of up to 10 kg/hour.